As part of Cockburn’s bicentenary celebrations the UK’s leading Port, Special Reserve, will be available in three brightly coloured metal containers as of November in a selected number of major wine retailers. Port is a great and thoroughly traditional wine, but there are frequent calls to brighten up the wine merchant’s shelves so as to attract a new generation of consumers, hence this lively initiative to bring colour and fun to Port. No Christmas dinner in the UK is complete without a glass of fine Port and the Cockburn’s Bicentenary Tins, at no extra charge to the consumer, will be the perfect complement to the festive decorations at a time when every family in the co untry gets together for probably the only time in the year. 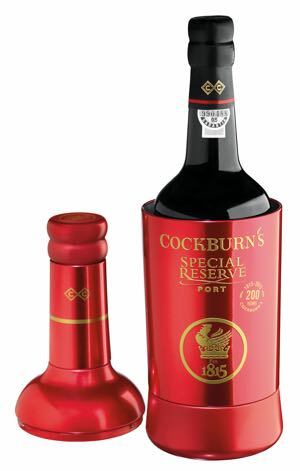 The original Cockburn’s Special Reserve was launched in 1969 and rapidly created an entirely new category that revolutionised the way people perceived Port. Cockburn’s Special Reserve took Port from the grand country houses of the UK and from London’s exclusive St James’s clubs to a far wider audience. Soon after its release this fine wine became the world’s Nᵒ1 Reserve Port, a position Cockburn’s Special Reserve maintains to this day. The three reusable and limited edition tins, available in glossy black and bright gold and red, come in the shape of the Special Reserve bottle. Inside, the classic bottle and fortified wine remain the same. Founded in 1815, Cockburn’s has been owned by Symington Family Estates since 2010.